UFOs: Book Details Well-Documented and Totally Unexplained Phenomena. Truth is scarier than fiction, and there are UFO stories that can’t easily be dismissed. Like most people, I was always skeptical about supposed UFO sightings, thinking they’re likely weather balloons, experimental military aircraft, or something that could be explained away. That changed with this book. My interest in UFOs began when my dad told me about a few stories he had read online, and I decided to read about them on Wikipedia. Some were so disturbing, with numerous witnesses and in some cases photos or videos, that I couldn’t stop reading about it. Which led me to purchase this book. Maybe plenty of people, perhaps a majority, would prefer to ignore this subject and hope it never impacts their lives. We don’t know what these various observed objects are or where they’re from – except one thing is completely clear: They do not follow the laws of physics, and far exceed anything man has ever had the capability of producing. They are certainly not made by human beings on this Earth. I’m still cautious to say that they are operated by extra-terrestrials. The word UFO means that it is “unidentified” or “unexplained,” and making any sort of conclusion would be attempting to explain it. Explanations remain best guesses only, and currently there’s no way to know for sure. 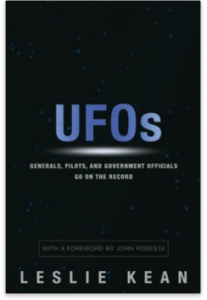 This book is a collection of the most plausible, well-documented UFO stories which have occurred up until the time of its publication. If you have doubted there is any such thing, your doubts will be gone if you can get yourself to read some of the stories in this book. The author makes no conclusions about what they are, and neither do I. Except that it’s clear that these flying objects represent technology so advanced, that humans currently have no prospects of creating anything similar. It remains a mystery, and is guaranteed to creep out anyone. I have been interested all my life. Heard a lot of stories from the Art Bell radio program from 1995 to current. I bet this book is awesome!